Painted walls are a great concept for people who tend to spend more than a few months in a home. For those of us with more nomadic tendencies textile on walls is a cheaper, easier alternative that won't damage our security deposits. 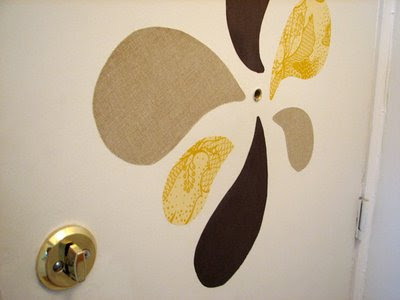 Jessica (click for blog) has an excellent tutorial for mounting fabric on walls without damaging the painted surface. Side Note: We have the same whisk! • The best ones are thick enough so that no glue will be showing through to the front. Backed fabrics will work the best when applying glue but keep in mind that they have tendencies to to shrink more (paper backing more than woven) so you will need to get more of it. • Liquid fabric starch can be used in place of glue. It is great for renters as it is easily removable and the fabric can be washed and re-used for another project. • Other things to look for is resistance to staining, mildew (especially when used in bathrooms), fading, shrinking and fire-rating. You can also ask to have your material stain-guarded when you purchase it. This might be a good idea, especially when applied in heavy traffic areas of the home. • One last detail is the trim. For a finished look you will want to hide the edges. Molding or a decorative ribbon will get the job done. That's cute! I knew you could use fabric like wallpaper on a wall but I've never seen it used like this. I don't think I'll try to get my purse patched- it's faux leather, can they patch that? What a great idea --- show your personality even in a temporary abode! I love starched fabric on walls. I put a post up about this a few months ago. If that picture is yours, way to go. It is "ridiculously cute." Thanks for stopping by! Great tips, thanks for sharing!! Hope you are well and wishing you a good weekend too!